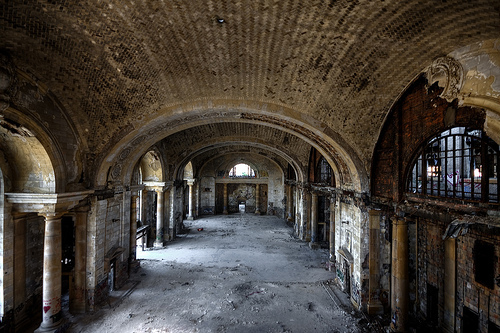 Detroit is emblematic of American transportation history, with all its ups and downs (shown here is its abandoned but impressive Michigan Central Station). Can the city become a model for transportation innovation and urban revitalization? Photo by Яick Harris on Flickr. On Tuesday night, PBS premiered the latest installment of its Blueprint America series on the challenges of renewing America’s decaying infrastructure. (We mentioned it the other day in our post about America 2050.) The newest episode, “Beyond the Motor City,” is a broad look at our country’s transportation history through the lens of the experience of Detroit, a city once renowned for its auto manufacturing and now for its extreme deterioration. A compelling mix of documentary filmmaking and advocacy, the episode lays out Detroit’s urban and transportation problems while examining the federal role (or lack thereof) in transportation throughout American history. Filmmakers view Detroit as the canary in the coal mine – and a potential model for other American cities. In its dual role as the archetypal auto-dependent U.S. city and the home of the auto industry, Detroit has suffered intensely with the decline of domestic car manufacturing. If the city can reinvent itself, the documentary suggests, there is hope for other U.S. urban areas – and for American innovation and technology development – as we move into a post-automobile future. “Beyond the Motor City” asks some tough questions that are yet to be answered. Can Detroit reinvent itself? Will the city’s extreme situation lead to innovation, and will that innovation pay off? Is a new era dawning in American federal transportation policy? Will Obama’s high speed rail be our AVE? Keep your eye on the Blueprint America Web site for notifications of upcoming episodes and for news, reports, and online videos related to infrastructure issues.